Marcos Maidana is a proven tough guy. Robert Guerrero is a proven gentleman. On Aug 27, at the HP Pavilion in San Jose, Ca, WBA super lightweight champion Maidana (30-2, 27 KOs) battles WBA lightweight champion Guerrero (28-1, 18 KOs) in an intriguing 12- round affair. Guerrero, of nearby Gilroy, is moving up in weight to challenge the Argentine born Maidana. He’s also moving up in class having never faced someone with the sheer firepower of Maidana. Four months ago Guerrero dominated the determined Michael Katsidis over 12 one-sided rounds. Guerrero used his superior boxing ability to frustrate the brawling Katsidis. The victory was arguably the biggest in the 28 year-olds career, fortifying his position as one of the major players in the division. Maidana, also 28 could be looking at his third consecutive tough fight. Last December Amir Khan floored him with a textbook hook to the body. Maidana got up grimacing, and the fight looked over. Showing an amazing amount of resiliency Maidana survived, and by the middle rounds had found his second wind. Khan hung on for the win but not before staggering around the ring like a toddler learning to walk. Next the fearless Maidana faced fading legend Erik Morales, in what many experts predicted would be an easy victory. He used his power and strength in the early going to rock Morales but this time it was Morales, who dug deep, and reclaimed some of his fading skills to out box Maidana and beat the younger fighter to the punch. Though stunned late in the fight Maidana still managed to eke out a majority decision victory. Guerrero's key going into the fight is his more versatile style. He has to find a way to keep the ever intense Maidana off-balance. Maidana has problems with boxers, and “The Ghost” can box. But can he do it against a world class fighter? To win Guerrero needs to box intelligently and stay disciplined. He must sting Maidana with jabs and counter hooks and the make the slugger respect him. His chin though solid has never been tested by someone with Maidana’s power. A few dents could change the direction of the fight quickly. Maidana must hurt Guerrero early and break him down to win the bout. “El Chino” will be stalking and firing hooks from all angles. If he can get Guerrero on the inside, he could do some damage. One punch at a time won’t win him the fight. 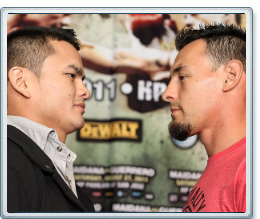 In an entertaining fight, Robert Guerrero will out slick Marcos Maidana and win a close decision.